Showing team pride. This card allows you to show your team pride with all 31 teams available, as well as 5% back on rotating categories up to $1,500 a quarter after activation, then another 5% back at the end of your first year with the Cashback Match. Choose your favorite team & show your pride – all 31 teams available. 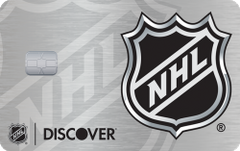 Save 10% at Shop.NHL.com and NHL.TV™.